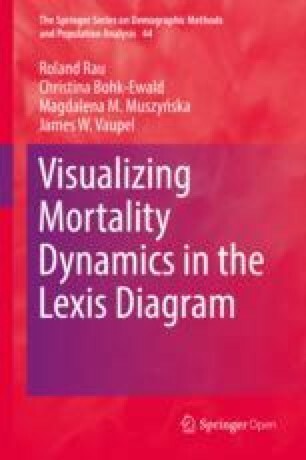 Rates of mortality improvement, as presented in the previous two chapters, are an excellent tool to illustrate mortality dynamics. They can not be directly translated to contributions to changes in life expectancy. Using Arriaga’s decomposition approach, we plot maps for selected countries from the Human Mortality Database, showing which ages contributed most to the respective change in life expectanc over time. Different perspectives can provide different insights into mortality dynamics. Chapters 6 and 7 investigated the relative change of death rates over time. The same “ROMI” does not necessarily translate to the same change of life expectancy, though, neither over time nor at different ages: A large reduction of infant mortality in the past had a major impact on life expectancy whereas the same proportional reduction would affect life expectancy only slightly since infant mortality is already (and thankfully) at a very low level. Analogously, the same rate of mortality improvement at the same time may have considerably different effects on life expectancy. For instance, an annual mortality decline by x per cent at age 80 has a much larger impact on life expectancy than a decline by x per cent at age 100. The age-specific contribution to the difference in life expectancy, Δ x , consists of two parts. The first part (until the + sign) estimates the direct effect, i.e., the change in life expectancy only due to the change in mortality at this given age x. The second part is the sum of an indirect effect and an interaction effect (Preston et al. 2001, p. 64). A geometric explanation might help to understand what is meant by this second component as it often appears to be confusing: Life expectancy can be interpreted as the area under the survival curve. In case of a decline in mortality at age x at time point t the survival curve at this age is higher than at time point t − 1. This is meant by the direct effect. For the sake of simplicity, let’s assume that mortality only changed at age x. Nevertheless, the survival curve will be also higher at age x + 1: A survival curve where the survival at age x + 1 was at the same level as at t − 1 would require an increase in mortality. This “wake” of a change in mortality at one age affecting the survival function at subsequent ages is estimated by the second component. We followed exactly the same procedure as in Chap. 5 to obtain the required death rates: Raw death rates, based on death counts and corresponding exposure times from the Human Mortality Database (HMD, 2017), were smoothed assuming Poisson distributed death counts using Camarda’s MortalitySmooth package (Camarda 2012, 2015). The life table functions l x , L x , and T x were estimated using the approach outlined in Chapter 3 of Preston et al. (2001). The values for a x , the mean duration lived at age x by those who died at age x, were taken from the HMD. While any kind of difference in calendar time could be used, we decided to estimate the age-specific contributions within an interval of ten years. I.e., we compared 1960 to 1950, 1961 to 1951, …. The years on the x-axis in Figs. 8.1, 8.2, 8.3, 8.4, 8.5, 8.6, 8.7, 8.8, 8.9, 8.10, 8.11, 8.12, and 8.13 refer to the latter time point. Thus, the values at any age x in year 1980 denote the contribution of changing mortality at age x between 1970 and 1980. The choice of a ten year difference is, of course, arbitrary but it allowed us also to express the contribution in “meaningful” units: We used days and weeks and—in exceptional cases of substantial improvements or deterioriation in survival—months. The surface maps were plotted using a terrain color scheme: Green indicates moderate contributions to life expectancy. When the color turns to brown, that age alone contributed at least one week to the increase in life expectancy during the decade of observation. Very bright brown areas depict contributions of one month or more. Blue colors denote negative contributions. Just like deeper shades of blue suggests lower depths below sea level on geographic maps, they indicate here changes in age-specific mortality that bring life expectancy down. Again, we have not included the whole set of countries from the HMD but rather a subset of countries with rather peculiar features, which we already pointed at in previous chapters. Figures 8.1 and 8.11 for Belarus and Russia, respectively, reiterate our findings of strong period effects from Chap. 6 Although our focus is mainly on mortality dynamics of women, we selected data for men here on purpose since the decline in life expectancy and fluctuations over time were more pronounced for males than for females (e.g., Meslé 2004). The vertical ROMI patterns in Fig. 6.18 (Chap. 6, p. 62) suggested that all ages between 15 and 75 were affected by the strong positive and negative period effects in Russia. Figure 8.11 in the present chapter, though, allows us to narrow down the age-range if we are interested in the contribution to changes in life expectancy. Compared to ten years earlier, changing mortality of men aged between 20 and 50 years appears to be the main contributor to the increase in life expectancy during the 1980s, fueled at least partly by Gorbachev’s anti-alcohol campaign (Leon et al. 1997). As we have already seen in Chap. 6, the end of the Soviet Union in the early 1990s induced a major rise in mortality in Russia and other successor states. It seems almost impossible that mortality increased as much at ages 50 to 65 in Belarus (Fig. 8.1) that some single ages depressed life expectancy by one month or more within a ten-year interval. Even more astonishing are the results for Russia (Fig. 8.11) where the change in mortality at single ages between 40 and 55 caused a decline of life expectancy of six weeks and more. The end of socialism/communism in eastern Europe in the early 1990s was less of a problem for Poland, though, serving as an example of a country from the former Warsaw Pact (see Fig. 8.9 for women and Fig. 8.10 for men). Whereas mortality also increased for men at working ages throughout the 1970s and 1980s, it took only a few years after the fall of the iron curtain, to see exactly the same kind of ages contributing two weeks or more to gains in life expectancy throughout a decade—a development, which appears to be still ongoing. It took even less time for Polish women to benefit from the regime change than for their male peers. The increase in life expectancy almost immediately after 1989/1990 was primarily triggered by survival improvements among women aged 60–85 years. A similar picture as for Poland emerges for females and males from the former “GDR” (Figs. 8.4 and 8.5): Stagnating or even increasing mortality throughout the 1970s and 1980s among men at working ages does not immediately disappear with the end of the political regime. Indeed, mortality even increased slightly for males aged about 30–50 years. Marc Luy (2004, p. 133) showed that “[t]his effect can be attributed almost exclusively to diseases of the digestive system (mainly due to diseases of the liver) and the cause of death chapter ’injury, poisoning and certain other consequences of external causes’ (mainly resulting from traffic accidents).” The group that was the fastest to adapt to the new situation were German women from the former eastern part. Faster than Polish women or men from eastern Germany, improvements in survival started immediately in 1990. Declining mortality where single ages contributed at least two weeks to the increase in life expectancy within ten years were representative of the first two decades after Germany’s reunification. Women aged 65 to 80 contributed even one month or more from the mid-1990s to the mid-2000s. A contribution of two weeks or more of single ages to the increase in life expectancy was already common among women in the former western part of Germany since the 1970s (Fig. 8.6). In fact, the peak of one month and more for women aged 65 to 80 could be interpreted as an indicator for the catching-up period of the “cardiovascular revolution” that already started in the 1970s in the former FRG and many other western countries—see, for instance, the figures for French and Swedish women in Figs. 8.3 and 8.12. Sweden was actually one of the first countries with a sustained decline in old-age mortality as pointed out by Kannisto (1994). As reflected by the narrowing bands of two weeks and more in Fig. 8.12, contributions of older ages to the increase in life expectancy have been smaller than in some other “vanguard” countries such as France or Japan. Drefahl et al. (2014) demonstrate that different trends for mortality from circulatory diseases were the main reason that Sweden is “losing ground”. Leon, D. A., Chenet, L., Shkolnikov, V. M., Zakharov, S., Shapiro, J., Rakhmanova, G., Vassin, S., & McKee, M. (1997). Huge variation in Russian mortality rates 1984–1994: Artefact, alcohol, or what? The Lancet, 350(9075), 383–388. https://doi.org/10.1016/S0140-6736(97)03360-6, http://www.sciencedirect.com/science/article/pii/S0140673697033606.